All I know is this: there is a lot more going on behind those beautiful eyes than we humans have ever given them credit for, and as a mother who was able to nurse all four of my babies and did not have to suffer the agonies of losing my beloved offspring, I feel her pain. I would like to tell you a story that is as true as it is heartbreaking. When I first graduated from Cornell’s School of Veterinary Medicine, I went into a busy dairy practice in Cortland County. I became a very popular practitioner due to my gentle handling of the dairy cows. One of my clients called me one day with a puzzling mystery: his Brown Swiss cow, having delivered her fifth calf naturally on pasture the night before, brought the new baby to the barn and was put into the milking line, while her calf was once again removed from her. Her udder, though, was completely empty, and remained so for several days. As a new mother, she would normally be producing close to one hundred pounds (12.5 gallons) of milk daily; yet, despite the fact that she was glowing with health, her udder remained empty. She went out to pasture every morning after the first milking, returned for milking in the evening, and again was let out to pasture for the night — this was back in the days when cattle were permitted a modicum of pleasure and natural behaviors in their lives — but never was her udder swollen with the large quantities of milk that are the hallmark of a recently-calved cow. I was called to check this mystery cow two times during the first week after her delivery and could find no solution to this puzzle. Finally, on the eleventh day post calving, the farmer called me with the solution: he had followed the cow out to her pasture after her morning milking, and discovered the cause: she had delivered twins, and in a bovine’s “Sophie’s Choice,” she had brought one to the farmer and kept one hidden in the woods at the edge of her pasture, so that every day and every night, she stayed with her baby — the first she had been able to nurture FINALLY—and her calf nursed her dry with gusto. Though I pleaded for the farmer to keep her and her bull calf together, she lost this baby, too—off to the hell of the veal crate. 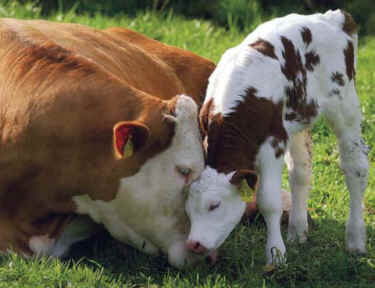 First, she had memory — memory of her four previous losses, in which bringing her new calf to the barn resulted in her never seeing him/her again (heartbreaking for any mammalian mother). Second, she could formulate and then execute a plan: if bringing a calf to the farmer meant that she would inevitably lose him/her, then she would keep her calf hidden, as deer do, by keeping her baby in the woods lying still till she returned. Third — and I do not know what to make of this myself — instead of hiding both, which would have aroused the farmer’s suspicion (pregnant cow leaves the barn in the evening, unpregnant cow comes back the next morning without offspring), she gave him one and kept one herself. I cannot tell you how she knew to do this—it would seem more likely that a desperate mother would hide both.